DENVER, CO, UNITED STATES, April 2, 2019 /EINPresswire.com/ -- Over one million people attempt suicide in the United States each year; tragically nearly 50,000 die. Today, an American is more at risk of dying from suicide than from an automobile accident, and more than twice as likely to die of suicide as homicide, war and terrorism combined. Suicide isn’t just a mental health issue. It's a matter of public health, and we must address it now. The American Association of Suicidology (AAS) is dedicated to saving lives and in healing those affected after a loss. 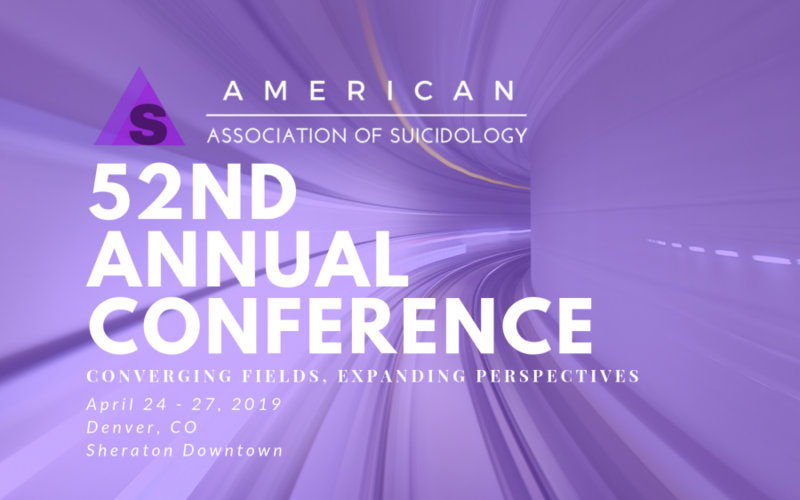 In the service of its mission, AAS is sparking a cultural shift to create solutions at its 52nd Annual Conference at the Sheraton Hotel Downtown, in Denver, Colorado, April 24 - 27, 2019. The conference theme, ‘Converging Fields, Expanding Perspectives,’ will pull from diverse views across disciplines and countries, allowing us to find innovative ways to work together.